Then I would also like some advice. Currently I am running a screen (lit only on 1 side) 25cmx18cm giving me 450cm2. The screen is lit by 11 x 1 watt leds consisting of 9 Red and 2 Blue on a photo period of 16hours. I still need to run about 250ml of phosphate media to keep my levels acceptably low otherwise I start to get a algae layer on my sand bed. I would like to know what adjustments I should make to my scrubber to eliminate the use of phosphate media completely? Currently I am using the upflow design for what its worth. Well for your current scrubber, you can certainly use more light. You could go as high as 45 LED watts. Mean time you could take your current LEDs up to 22 hours. Also, if some brown on the sand is the only concern, just add a sand-sifting diamond back goby; he will eat through the sand in no time. The increase in photoperiod did not do the trick. I currently have 0 nitrates (salifert) and get measurable phosphates on salifert. 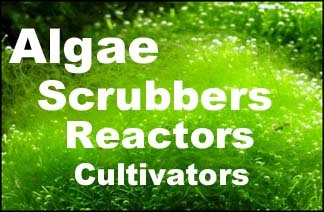 It is a reasonable assumption that the scrubber cannot remove phosphates without nitrates begin present. So the question is what is the lowest photoperiod I can run my scrubber at? The aim is to try and get nitrates up to allow the phosphates to be utilised by the scrubber. I have always believed that if a scrubber is strong enough, it can pull P down even with very little N, and if anything you can just try feeding more. But this is based on very strong scrubbing, similar in levels to reefs. So it might be worth trying a test in your case; keep the scrubber full power, and dose potassium nitrate, up to maybe 20 ppm, and see what P does.